Installation view: Means of Measurement, YYZ Artists' Outlet, Toronto, 1987. Photo: the Artist. Mattered World consists of an electrically lit globe: seed beads, cotton and nylon thread woven over a welded steel frame. This globe is connected to a cone of copper tubing riveted and lead soldered onto a steel sheet cone base. 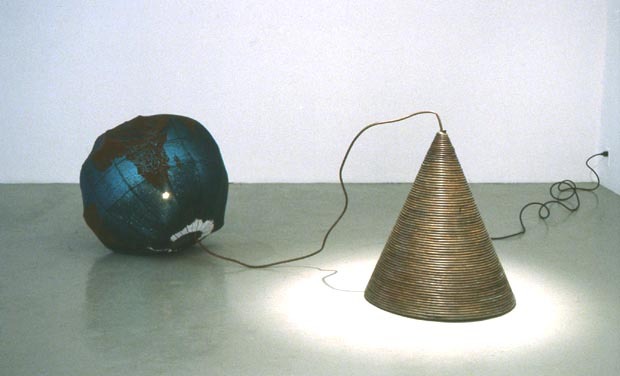 A copper tube containing electrical wiring runs from inside the globe to the cone, the wire continues out the bottom of the cone and plugs in to an electrical outlet. Overall Dimensions: 80 x 190 x 75 centimeters. Collection of the Art Gallery of Ontario. Mattered World is a part of the artist’s first solo exhibition at YYZ Artists’ Outlet, Toronto, and titled Means of Measurement. Means of Measurement is a sculptural and photographic installation concerned with the division and definition of bodies, exemplified by earth, human form and space. These works are inspired by historically conventional representations and a desire to vary these perceptions. The photographic work is a reference study which defines the various concerns involved in creating the sculptural pieces; it loosely connects various systems of division defined within the fields of design, fashion, art, architecture, nature and metaphysics. - Lee Dickson, 1987. The other works in this exhibition were: Measuring Device, Photo Research and Unresolved. Grenville, Bruce. Lee Dickson. Lethbridge: Southern Alberta Art Gallery, 1990. Patton, Andy. Information Systems. Toronto: YYZ Books, 1988. Scott, Kitty. Other Frontiers. Glasgow: Third Eye Centre, 1991. Thériault, Michèle. Perspective 90: Lee Dickson and Douglas Walker. Toronto: Art Gallery of Ontario, 1990. "Artists with Their Work" Program, Art Gallery of Ontario. 1992: photo. Baele, Nancy. "Visual Arts." The Ottawa Citizen Jul 7 1988. Grenville, Bruce. "Review: Lee Dickson, YYZ Artists’ Outlet, Toronto." Parachute 47 [Montreal] 1987: 41-42. Hitzeroth, Connie. "Technology Shows Its Ages." Now [Toronto] Jan 14-20 1988: 38. Lypchuck, Donna. "Fast Forward." Canadian Art [Toronto] Fall 1989: 52-53, photo. Skene, Cameron. "The Measure of All Things." Montreal Mirror Jan 27 1989: 16. Thériault, Michèle. "Perspective 90: Lee Dickson and Douglas Walker." AGO News 12.7. Jul/Aug 1990: photo. The Canada Council and the Ontario Arts Council.